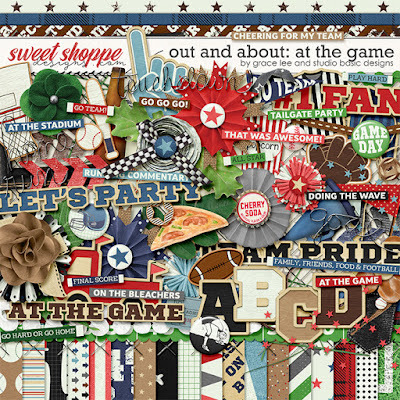 Out and About: At the Game with Studio Basic Designs is such an awesome addition to their 'get-out-and-explore' themed collection. This time is more than just going out! It is about passion! Are you crazy about baseball, football, soccer, softball or any other sport? If so this is the perfect collection for you! Whether you're chilling at home with the family on game day, or sitting in the stands rooting on your favorite player, we have the perfect kit to scrap those special sports moments. and over 100 elements. The elements included are: arrows, banners, baseball balls, basketball hoop, bats, beer bottle, bows, buttons, finger, flags, flairs, flowers, foliages, football ball, frames, glove, leaf, mega phone, paper piece, pizza slice, popcorn, ribbons, ricrac, rosette, stars, star scatters, shirts soccer ball, stitch, strings, tag, ticket, and titles.